Step 1 Place a rack in the upper third of the oven and heat the oven to 375 degrees. Cover the peppers with boiling water and allow to soften for at least 30 minutes, then stem, seed and reserve. Step 2 While the peppers are softening, toast the nuts separately until golden and aromatic, 8 to 10 minutes. If the hazelnuts have skins, remove their skins by rolling them in a kitchen towel once they are cool. Set the nuts aside and raise the oven temperature to broil. Step 3Halve the tomatoes lengthwise and place them, skin side up, on a foil-lined baking sheet. Brush 1 tablespoon of oil over the tomatoes and broil the tomatoes until the skins begin to darken and crack, about 5 minutes. Cool on their tray, then peel, core and set aside. Step 4In a skillet, heat 1 tablespoon of oil and fry the bread until golden brown. Cool and set aside. Step 5In a food processor, coarsely chop the garlic, salt, fried bread and nuts. Add the peppers, tomatoes, paprika and vinegar and process to a rough paste. Slowly pour in the remaining olive oil in a steady stream and process until just combined. In Recipes-list.com we have selected the most viewed recipes from category - Best recipes Sauces and condiments Vegetarian . Enjoy the best recipes specially selected for you! 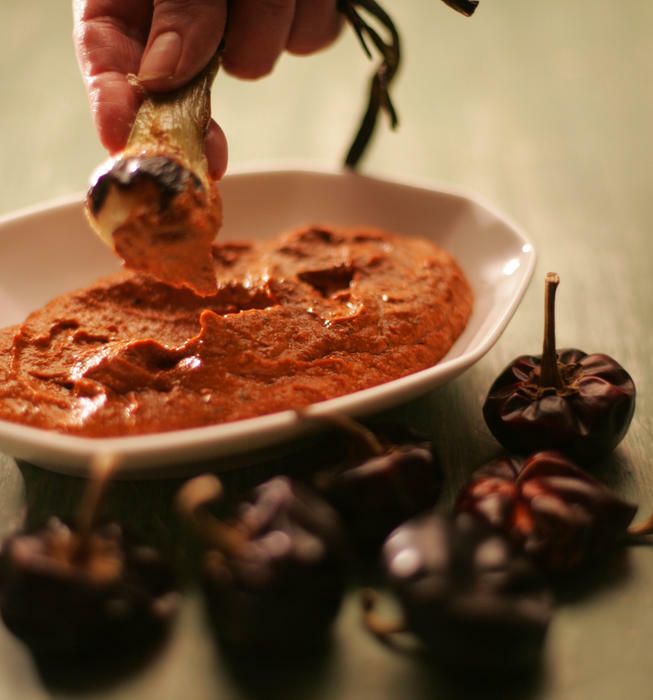 Basic romesco sauce is the right choice that will satisfy all your claims.